This is a page dedicated to introduce information about your restaurant. Besides, help you present restaurant chefs or restaurant management systems as well as the position of each chefs in your restaurant. All the restaurants services will be presented here. With different types of services that you would recommend to your customers, you can present each type of cell with different colors helping them easily refer. Basically, portfolio page will present the culinary arts in creating new dishes and flavor combinations to customers. 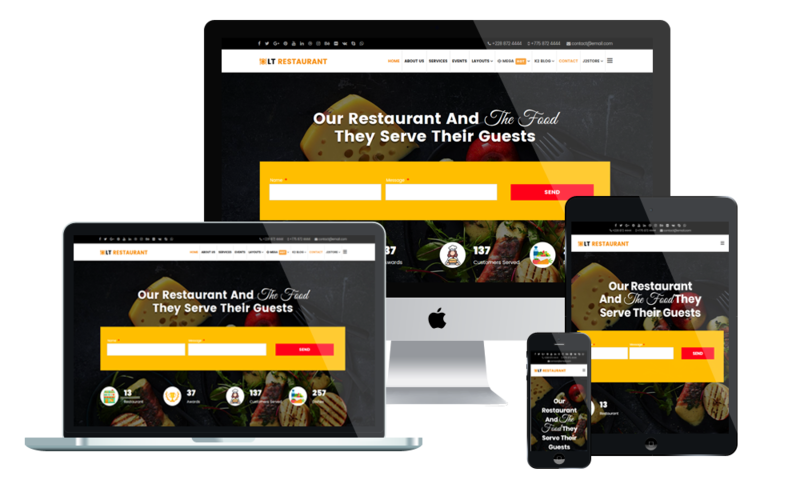 Share the new blog posts related to food as well as objects related to your restaurants cuisine on social medias like Facebook, Twitter, Google+… This is the best way to improve your customers relationship via blog. For this page, customers easily search address, phone or fax number of your restaurant with separate tabs for each section. On the other hand, they can send their feedback via mail or navigate to your restaurants location by map just a click. The menu page is especially important to categorize kinds of different menu that are suitable for all cases such as menu 1, menu 2, menu 3 or menu 4 … from your restaurant.